Ask Ethan: What’s the difference between a Fermion and a Boson? The particles of the standard model, with masses (in MeV) in the upper right. The Fermions make up the left three columns; the bosons populate the right two columns. Image credit: Wikimedia Commons user MissMJ, PBS NOVA, Fermilab, Office of Science, United States Department of Energy, Particle Data Group. If you think that spin-1/2 and spin-1 aren’t that different, the actual science may shock you. Could you explain the difference between fermions and bosons? What differs from an integer spin and a half-integer spin? At first glance, it might seem like categorizing particles by these properties is completely arbitrary. 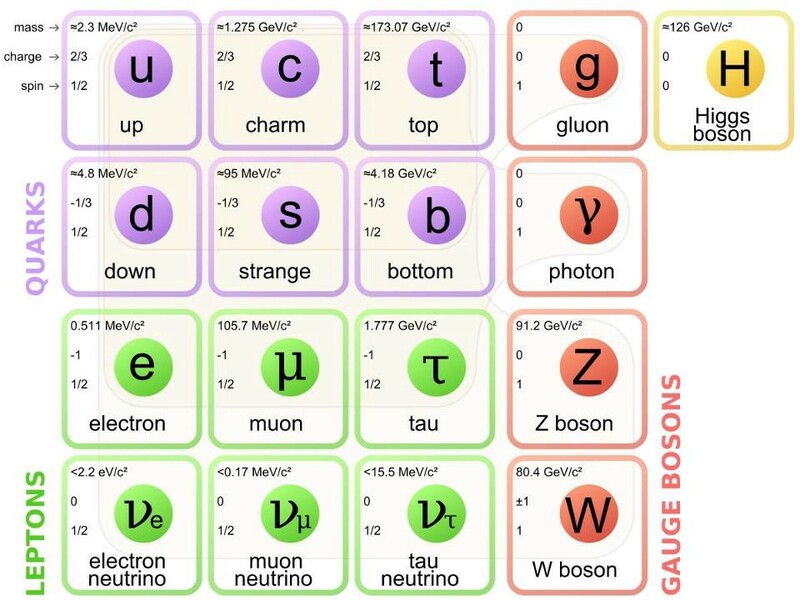 The known particles in the Standard Model. These are all the fundamental particles that have been directly discovered; the graviton, although undiscovered, would be a spin=2 boson. Image credit: E. Siegel. After all, a particle is a particle, right? Surely there are bigger differences between the quarks (which experience the strong force) and the leptons (which don’t) than there are between fermions and bosons? Surely the difference between matter and antimatter means more than the spin of your particle? And whether you’re massive or massless ought to be a very big deal, certainly compared to something as trivial as angular momentum, right? As it turns out, there are a number of small differences associated with spin that matter, but there are two very big ones that matter more than most people — perhaps even most physicists — realize. The photons, particles and antiparticles of the early Universe. It was filled with both bosons and fermions at that time, plus all the antifermions you can dream up. Image credit: Brookhaven National Laboratory. The first one is that only fermions have antiparticle counterparts. If you ask what a quark’s antiparticle is, it’s an antiquark. An electron’s antiparticle is the positron (an anti-electron), while a neutrino has an antineutrino. On the other hand, bosons are the antiparticles of other bosons, with many bosons being their own antiparticle. There is no such thing as an antiboson. Collide a photon with another photon? A Z0 with another Z0? It’s just as good, from a matter-antimatter perspective, as an electron-positron annihilation is. A boson — like a photon — can be its own antiparticle, but fermions (like electrons) and antifermions (like positrons) are distinct. Image credit: Andrew Deniszczyc, 2017. You can also build composite particles out of fermions: two up quarks and one down quark make a proton (which is a fermion), while one up and two down make a neutron (also a fermion). Because of the way spins work, if you take an odd number of fermions and bind them together, your new (composite) particle will act like a fermion, which is why you get protons and antiprotons, and why a neutron is different from an antineutron. But particles that are made of even numbers of fermions, like a quark-antiquark combination (known as a meson), behave as a boson. The neutral pion (π0), for instance, is its own antiparticle. The reason behind this is simple: each of those fermions is a spin ±1/2 particle. If you add two of them together, you can get something that’s spin -1, 0, or +1, which is an integer (and hence a boson); if you add three, you can get -3/2, -1/2, +1/2, or +3/2, which makes it a fermion. So particle/antiparticle differences are a big one. But there’s a second difference that’s perhaps even more important. The electron energy states for the lowest possible energy configuration of a neutral oxygen atom. Because electrons are fermions, not bosons, they cannot all exist in the ground (1s) state, even at arbitrarily low temperatures. Image credit: CK-12 Foundation and Adrignola of Wikimedia Commons. The Pauli exclusion principle only applies to fermions, not to bosons. This rule states, explicitly, that in any quantum system, no two fermions can occupy the same quantum state. Bosons, however, have no such restriction. If you take an atomic nucleus and start adding electrons to it, the first electron will tend to occupy the ground state, which is the lowest energy state allowed. Because it’s a spin=1/2 particle, that electron’s spin state can be either +1/2 or -1/2. If you put a second electron on that atom, it will have to have the opposite spin state to also be in the ground state. But what happens if you want to add more electrons? They can’t fit into the ground state anymore, and need to go up to the next energy level. The energy levels and electron wavefunctions that correspond to different states within a hydrogen atom. Because of the spin = 1/2 nature of the electron, only two (+1/2 and -1/2 states) electrons can be in any given state at once. Image credit: PoorLeno of Wikimedia Commons. This is why the periodic table is arranged as it is. This is why atoms have different properties, why they bind together in the intricate combinations that they do, and why each element in the periodic table is unique: because the electron configuration of each type of atom is unlike any other. The fact that no two fermions can occupy the same quantum state is responsible for the physical and chemical properties of the elements, for the huge variety of molecular configurations we have today, and for the fundamental bonds that make complex chemistry and life possible. The way that atoms link up to form molecules, including organic molecules and biological processes, is only possible because of the Pauli exclusion rule that governs electrons. Image credit: Jenny Mottar. On the other hand, you can put as many bosons as you like into the same quantum state! This allows the creation of very special bosonic states known as Bose-Einstein condensates. By cooling bosons sufficiently, so that they fall into the lowest energy quantum state, you can put an arbitrary number in there. Helium (made up of an even number of fermions, so acting like a boson) becomes a superfluid at low enough temperatures, a consequence of Bose-Einstein condensation. Since then, gases, molecules, quasi-particles and even photons have been brought into this condensed state. It’s still an area of active research today. A Bose-Einstein condensate of rubidium atoms before (L), during (middle) and after (R) the transition to a BEC state is complete. The graphic shows three-dimensional successive snap shots in time in which the atoms condensed from less dense red, yellow and green areas into very dense blue to white areas. Image credit: NIST/JILA/CU-Boulder. The fact that electrons are fermions is what keeps white dwarf stars from collapsing under their own gravity; the fact that neutrons are fermions prevents neutron stars from collapsing further. The Pauli exclusion principle responsible for atomic structure is responsible for keeping the densest physical objects of all from becoming black holes. A white dwarf, a neutron star or even a strange quark star are all still made of fermions. The Pauli degeneracy pressure helps hold up the stellar remnant against gravitational collapse, preventing a black hole from forming. Image credit: CXC/M. Weiss. When matter and antimatter annihilate or decay, they will heat a system up by a different amount depending on whether the particles obey Fermi-Dirac statistics (for fermions) or Bose-Einstein statistics (for bosons). This is why the cosmic microwave background is 2.73 K today, but the cosmic neutrino background corresponds to a temperature that’s about 0.8 K cooler: thanks to annihilation and these statistics in the early Universe. The fit of the number of neutrino species required to match the CMB fluctuation data. This data is consistent with a neutrino background that has the energy-equivalent temperature of 1.95 K, much cooler than the CMB photons. Image credit: Brent Follin, Lloyd Knox, Marius Millea, and Zhen PanPhys. Rev. Lett. 115, 091301. The fact that fermions are half-integer spin and bosons are integer spin is interesting, but far more interesting is the fact that these two classes of particles obey different quantum rules. At a fundamental level, those differences enable our very existence. That’s not a bad day at the office for the difference of just ±1/2 in a quantity as unremarkable as intrinsic angular momentum. But the enormous consequences of a seemingly quantum rule illustrate just how significant spin — and the differences between bosons and fermions — can actually be. This post first appeared at Forbes, and is brought to you ad-free by our Patreon supporters. Comment on our forum, & buy our first book: Beyond The Galaxy!